in the food pantry located in the PUB Room 9203. Whether they need connection to financial resources or food for the weekend, Shoreline Community College students have an additional wrap-around service on their side: Benefits Hub. A United Way project, the goal of the Benefits Hub is to combat homelessness, food insecurity, and other hardships that may lead students to struggle or drop out. The Benefits Hub is located in the heart of the campus in the Pagoda Union Building (PUB), a high-traffic location intentionally chosen for its visibility. The Hub hosts free workshops on budgeting, credit, financial aid, nutrition, and how to eat healthily on limited finances, among other topics. It also connects students to resources both on and off campus. Benefits Hub connects students to myriad on- and off-campus resources including organizations that offer help with financial assistance for groceries and living expenses, discounted transit and utilities, and free or discounted health insurance, among others. One of the most visible and popular features of the Benefits Hub is the food pantry, housed in the Hub’s offices in PUB 9203. Stocked by donations, the food pantry offers canned goods, ready-to-eat, and protein items as well as some fresh foods for students facing food insecurity. It also stocks toiletries and personal hygiene items. The Food Pantry was started in 2013 by leadership in the College’s Center for Equity and Engagement, Women’s Center, and Multicultural Center. The partnership evolved into the (now) Benefits Hub. In addition to providing everyday food staples through the pantry, Benefits Hub also runs special programs throughout the year. They provided 19 holiday-themed meal bags over Thanksgiving and 32 winter break meal bags. The pantry recently added a new feature called “Logan’s Lunch Box,” a collection of pet food donations for students who struggle to afford supplies for their pets. The name of the collection box honors Logan, the late golden retriever of Dr. Cheryl Roberts, the College’s president. While the move to the PUB has helped Benefits Hub gain visibility, they know there are still more students to reach. 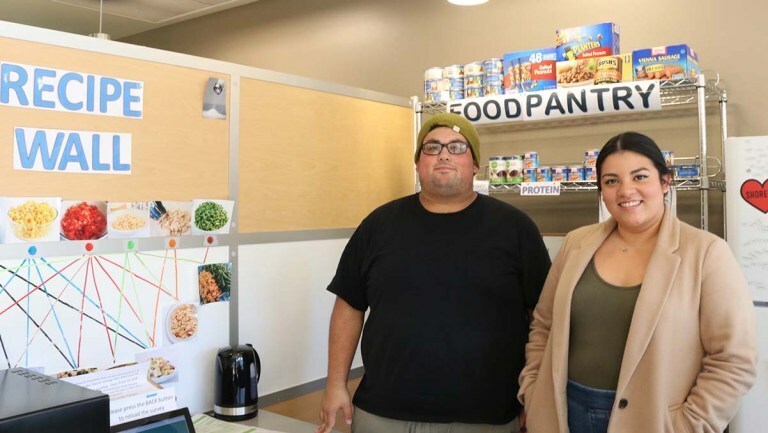 “The biggest challenge with the pantry, and all of our services, is getting the word out so students know we are here and they can come to us for help,” said Fartale. Open weekdays, Benefits Hub is available to all Shoreline Community College students and is located in PUB 9203. Learn more about other student support services on Shoreline’s campus. Shoreline Community College is located at 16101 Greenwood Ave N, Shoreline 98133. A campus map is HERE.